There are more than 285,000 podcasts registered with iTunes—but 95 percent of the these have fewer than 2,000 listeners. So you’ve been kicking around the idea of a podcast for a while, only to discover that the men’s shoe store down the street and your aunt Vicky’s knitting circle have both already beat you to iTunes. With hundreds of new podcasts flooding the market (thanks to the likes of Serial), you might have the sneaking suspicion that you’ve arrived late to the podcast party—no matter how truly brilliant your idea for a podcast is. Here are five ways to help you cut through all the noise. There are more than 285,000 podcasts registered with iTunes—but 95 percent of the these have fewer than 2,000 listeners. And there’s a reason for that. If you take a look at the top 100 podcasts on iTunes, most of them have a few key things in common: consistently high production value, thoughtfully structured episodes, and a relatable host with a unique perspective. "Audiences grow in fits and spurts, so tracking your growth will help you understand what works for your show." There are several spectacular resources to get you started toward some seriously good audio production. It you’re new to radio and look at nothing else, bookmark This American Life’s Make Radio page right now. The TAL team’s compiled a pretty comprehensive list of resources for radio makers, but I’d start with their first pick: the invaluable Transom.org. Transom’s in-depth gear reviews and technical how-tos will give you the nuts and bolts of recording and mixing, but they also host some really useful conversations about using music, writing for the ear, and finding your radio voice. Oh! And they’re doing a multi-part series on podcasting basics as I write this. Once you get going, don’t be afraid to reach out for feedback. If you’re in a big city like New York, Boston, or San Francisco, there’s more than likely a meetup of audio nerds, most of them totally lovely and willing to give your stuff a listen. If you’re not in one of those places, no worries– assembling a team of your smartest, meanest friends will do the trick. Finally, listen to a lot of radio, and try to reverse engineer what your favorite audio people are doing. Two podcasts–Tape and HowSound–are actually devoted to this exact endeavor. I got help from my friends Alex Kapelman and Whitney Jones for this one. They’re the creators of a podcast about music called Pitch — and they’ve done a great job of engaging with and mobilizing their listeners. One of the early tips they learned was tweeting back at every new follower on Twitter, to say hello and ask them how they found the show. Pro tip: pay attention to the answer to that question! It’ll give you clues about where your next thousand listeners might be hiding. Alex also recently put together a “How to Support Pitch” page on their site, with ideas for their audience about how to get the word out. And they try to end with an “ask” at the end of every episode—encouraging people to like them on Facebook or write a review in iTunes. Most important, Alex and Whitney both say their goal was always deeper than simply creating a passive listener base; they wanted to build a community of people who were curious about music in the same ways they were. One of these days we’ll crack the code for better podcast discovery—but in the meantime the single most effective way for people to find your podcast is by getting it featured or talked about on other podcasts. You’ll have an intuitive sense of which shows have audiences that might dig your work—reach out to them to make sure their producers know what you’re up to. Nick Quah’s awesome HotPod newsletter and TheTimbre.com–both of which offer podcast news and reviews–are great ways to stay up to speed on what else is out there. Make sure you’re reaching out beyond the world of podcasting as well. Write for publications that care about your area of expertise, and make it known where readers can hear more from you. Creating short form YouTube videos (for example, an animated version of an audio segment) is another great way to get noticed across different platforms. Just make sure you embed a button linking back to your website or your newsletter signup so you can capture that interest (tutorial here). Finally, don’t forget about your own guests! People who appear on your podcast are usually delighted to help get the word out–which is a great way to reach new pockets of people. Think hard about your release schedule. Weekly (or even daily) shows have a much easier time gaining traction, but you want to make sure you have a consistent product. As much as you can, plan your editorial calendar out in advance. That will allow you to start thinking about news pegs for specific episodes or reaching out ahead of time to groups and publications that might be interested in a particular topic–increasing the likelihood that your stuff will be surfaced. 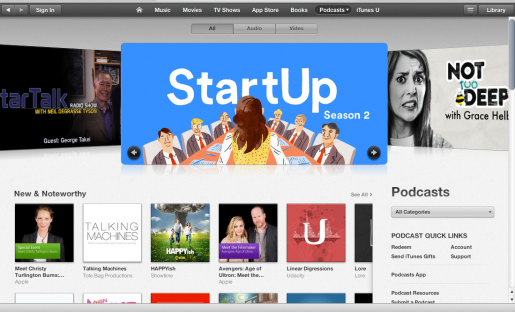 Another reason to plan ahead: the New and Noteworthy section of iTunes. Beginning the day you register your feed with iTunes, Apple gives you 8 weeks in which they’ll consider featuring you prominently in the iTunes store. Having several episodes already in the feed, plus one or two ready in the wings, demonstrates that you can produce quality stuff consistently. It also means that when people stumble across your podcast, they’ll have several episodes to download, doubling your download potential early on. Apple’s team is known for being really approachable and helpful with this stuff. When you publish an episode, you can tweet to them @itunespodcasts. Podcast metrics are notoriously hard to get a grip on. But as Rekha Murthy, director of digital distribution at PRX reminded me recently, podcasters still have it infinitely better than terrestrial radio producers ever dreamed. According to founder Mark McCrery, services like Podtrac will give you not only the number of downloads, but also a sense of the gender, household income, number of children, education, and download location of your audience. And better metrics for listening behavior may also be on their way. “Granular insights on listening are sort of the next frontier,” Murthy said. So far, Stitcher’s the only major app that will track percent completion of your episode. And though that data can only tell you about the Stitcher listening community, it may still offer some hints about which episodes are really resonating. Rekha also advises podcasters on PRX not to waste too much time trying to get listed on 3rd party audio sites, unless listens on those sites will be reflected in their entire podcast listen numbers. My two cents? Look into Soundcloud. It’s a big community and their embedding feature is great, so it’s worthwhile to add those numbers in manually. Audiences grow in fits and spurts, so tracking your growth will help you understand what works for your show. And it’ll come in handy if the glorious day ever arrives when you are ready to monetize. In the meantime, I’ll be right there with you. Over the last few months, I’ve been exploring some of these topics in (you guessed it!) a podcast, for the Tow Knight Center for Entrepreneurial Journalism. Listen to my latest episode — about viral audio in Zimbabwe — below. Kristen Clark (@TheNoisyNomad) is a dedicated patron of abandoned buildings and senior centers. She’s also a multimedia producer whose video and audio work has been featured on NOVA, WNYC, Radiolab, Voices of New York, and beyond. A recent alumna of CUNY’s Graduate School of Journalism, she writes and produces from her fourth-floor fire escape in Central Harlem. Her startup project, True Everywhere, is an immersive global storytelling podcast recorded in “3D” audio. All you need is a smartphone, a pair of earbuds and a seat on a park bench or subway — and we’ll drop you directly into a kitchen or street corner on the other side of the world.